Thank you very much for the kind invitation to address this committee. For decades, efforts to better regulate illicit and irresponsible arms exports and to strengthen arms control regulations have been a key focus of the activities of Project Ploughshares. We were strong advocates of the landmark international Arms Trade Treaty long before its adoption and have participated in every ATT Conference of States Parties as civil society representatives. We also keep a comprehensive database of Canadian military exports and have done so for more than 30 years. We were greatly encouraged by Canada’s decision to join the Arms Trade Treaty after a highly conspicuous absence and have engaged in a constructive spirit with colleagues at Global Affairs Canada on this important file. Our expert assessment, however, is that the proposed legislation, as currently considered by this committee, would not enable Canada to fully meet the requirements and expectations of the Arms Trade Treaty. We welcome a crucial amendment made to the bill that responds to one of the key concerns we and other civil society stakeholders expressed to the Standing House Committee on Foreign Affairs, concerning the inclusion of a substantial risk clause. I will focus my remarks today on what is perhaps the major remaining shortcoming of the proposed legislation. As Bill C-47 stands, it does not address the exemptions that have long been afforded to Canadian military exports to the United States. Under current practice, Canadian military exports to the U.S. are exempted from licensing and reporting requirements applicable to every other destination. Though related, these are two separate, major exemptions, one concerning licensing, the other concerning reporting. These exemptions are plainly incompatible with the letter and the spirit of the Arms Trade Treaty. We are aware that the position of Global Affairs Canada is that the exemptions granted to U.S.-bound exports are consistent with the ATT. For several reasons, we must express our disagreement with this view. As my colleagues have said, the ATT calls for the highest possible common international standards. There are two interrelated and equally important elements in this requirement: Highest possible standards and common international standards. Yet, the arrangement with the U.S. neither constitutes the highest possible standard, nor is it consistent with the standards applied to others. Article 2 is explicit about its applicability to all military exports covered under the treaty. Article 5 calls for the ATT to be implemented in a consistent, objective, and non-discriminatory manner. We find it very hard to see how “all” could be interpreted to mean anything other than the totality of Canadian exports, including those destined for the United States. Further, the treatment afforded to the U.S. is obviously out of line with the expectations of consistency, objectivity, and non-discrimination specified in article 5. Such exemptions would be incompatible with ATT obligations regardless of the recipient. In the case of the United States, they are especially problematic. The United States is the largest exporter of weapons and military equipment in the world. Canadian components can be incorporated into systems in the United States and then exported to third parties without requiring further authorization from Canada. The United States is also, by far, the largest recipient of Canadian military goods. Despite the lack of transparency in this regard, Project Ploughshares estimates that Canadian exports of military goods to the U.S. are worth as much as $2 billion annually, and this is typically more than half of total Canadian military exports. In the end, with Bill C-47 in its current form, the majority of Canadian military exports will neither be reported nor subject to export permit requirements, even after Canada joins the ATT. Critically, the United States is not an ATT state party and is not expected to become one in the near future. Canada, on the other hand, will be a state party, and the expectation is that all its arms export regulations will be entirely consistent with the provisions of the treaty. The notion that Canada’s arrangement with the U.S. is consistent with the treaty simply does not hold water. If such an arrangement were acceptable, imagine that every ATT state party exempted their largest recipient of military exports from both reporting and licensing obligations, even when the recipient is not an ATT state party. Clearly, this would defeat the purpose and aspiration of the treaty to have the highest possible universal standards. The whole regime upon which the treaty is founded would crumble under the weight of its ineffectiveness. Distinguished committee members, I would be remiss if I did not take this opportunity to highlight what I consider to be the most egregious challenge to the otherwise welcome rhetoric we have heard from Global Affairs Canada about the commitment to greater rigour and transparency around Canadian arms exports. I’m talking about continued exports to Saudi Arabia. The arguments given thus far for arming Saudi Arabia have all been morally and legally unconvincing. Ottawa now claims that stopping arms shipments may result in hefty financial penalties. How can it be that the Government of Canada’s sovereign mandate, prerogative, and obligation to faithfully implement the law, including cancellations of export permits, as the Minister of Foreign Affairs confirmed before this committee two days ago, are somehow subordinated to the language of a commercial contract and considerations of financial expediency? The government’s explicit recognition of its sovereign prerogative to freeze arms exports to Saudi Arabia, while not actually exercising this prerogative, only gives the illusion of firmness. As the debate unfolds, Canadian arms exports continue to be sent to Saudi Arabia, which is also the chief instigator of the devastating humanitarian crisis in Yemen, now on the brink of the worst famine in a century. Our government speaks loudly and proudly of Canada as a beacon of human and women’s rights. It touts its commitment to more stringent and transparent arms control regulations at every opportunity. It says it will be firm when human rights violations occur. It declares feminism and the pursuit of a rules-based international order to be key pillars of Canada’s engagement with the world. But, as Canada continues arming one of the worst human and women’s rights violators on the planet, the gap between rhetoric and reality is becoming wider. 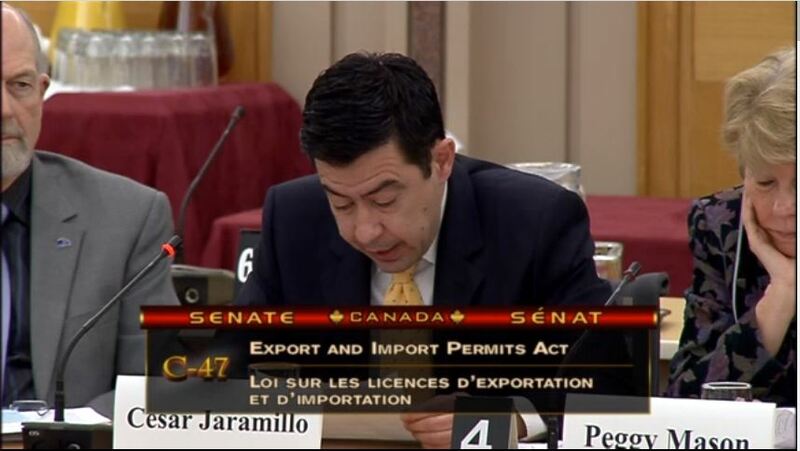 In this context, we encourage all stakeholders, including members of this committee, to seek strong, effective legislation for Canadian arms exports that is truly in line with modern expectations of rigour, accountability and transparency in the global arms trade, including full compliance with the obligations of the Arms Trade Treaty. Thank you.